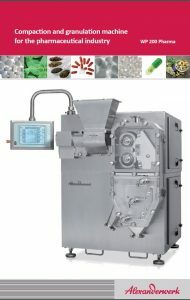 The Alexanderwerk WP 200 Pharma is especially designed as a production model that meets the highest requirements and standards of the pharmaceutical industry. With a throughput of up to 400 kg/h (lactose), the WP 200 Pharma covers the production of frequently changing, special products and small batches as well as compaction and granulation in continuous operation. The machine is standard equipped with the patented Combi-Vent-Feeder®. Through the improved de-aeration capability, more raw materials can be processed in a given period, leading to more efficient operations. Due to of its modular design, the WP 200 Pharma can be almost completely disassembled without special tools, with the cantilever roll design allowing for easy changeover and cleaning. To ensure a compact design, the machine has a low overall height and the control system is integrated in an external control cabinet. Numerous special or customized designs are available upon request. Due to technical changes or modifications, some details of the machines may deviate from what is shown here. Request the complete brochure to the desired machine from us. Click here for the contact form.